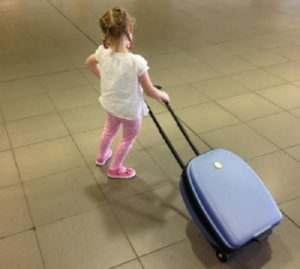 Having a little one who suffers from eczema as well as severe food allergies, travelling abroad can be daunting. Our daughter was diagnosed with her nut allergy days before going on an overseas holiday – it was an anxious time to say the least! So we have put together some tips for travelling/holidaying to help you prepare for that well deserved trip away! Routine: Don’t let your little one’s daily skin care routine suffer when on holidays . It will make for a more enjoyable time for everyone if you can keep up the management of your kids eczema. Airplane: Make sure you have moisturiser on board and re-apply often as flying dehydrates the skin. Bedding: Bring your own where you can – hotels may use strong laundry detergents on theirs that may irritate skin. Flannels/Face cloths: Bring your own and multiple. Emulsifying ointment: Bring enough for bathing each day and for moisturising more often than usual if going to a warm climate. Prescribed creams/ointments/medications: Err on the side of caution and take as many as you would use at home – usually coming in small size packaging they don’t take up too much room and worth it in case of need. Keep them with carry-on luggage. Scissors: Don’t forget your nail scissors (in checked luggage), little ones nails grow faster in the sunshine! Refrigerator: Ask for a fridge in the hotel room/apartment before you travel to store medication but also to keep creams cool. Swimming: Be careful how chlorinated the swimming pools are if this affects your child’s eczema. Make sure to apply emulsifying ointment before swimming to protect them. Sea water can be great for eczema, but you must also be careful if your child has broken skin in the salt water. Shruggi: Don’t forget your Itchy Little Monkeys Shruggi – especially for bed-time and if travelling long distances in the car. Start simply: If you feel too anxious about travelling abroad, look for stay-cation options for allergy safe travel. An enjoyable, manageable first holiday experience with your little one will boost your confidence and you may want to venture further afield next time. Language: Find out the translation for your little one’s allergies in the language of the country you are traveling to. Adrenaline pens: Make sure you bring a letter from your doctor, you may be asked for this at the airport. Airplane staff: For severe nut allergy sufferers, when boarding the airplane ask for who is in charge and ask them to make a PA announcement saying that there is a child on board with a severe nut allergy, for passengers not to eat nuts on board and that they won’t be selling products that are nut based. Snacks: Bring some snacks from home to ensure that you have reliable reserves for on the go. Food: Before you travel, contact a few restaurants in the area you will be staying in and ask them if they can accommodate your child’s allergies. Many times, we have found that pasta abroad is made from egg rather than wheat, so we regularly bring our own and ask the chef to cook it for us if theirs is not egg-free. Find out where the nearest doctor/24 hour emergency clinic is before you travel or when you arrive.